The Linksys RE3000W Wireless-N Extender lets you repeat the wireless signal of any access point or router to provide Internet connectivity to hard to reach areas through a wired or wireless connection. 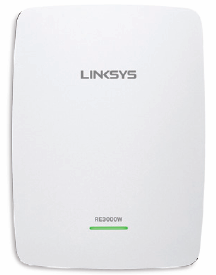 NOTE: You can also download the setup software from the Linksys RE3000W Product Page. Wi-Fi Protected Setup™ - When the Wi-Fi Protected Setup™ process is active, the light flashes slowly. When the WPS is successful, the light is continuously lit. If there is an error, the light flashes quickly (every second) for two (2) minutes. Wi-Fi Protected Setup™ (WPS) button – if you have client devices that support Wi-Fi Protected Setup™ such as wireless printers, this button automatically configures wireless connection and security after initial setup. If the extender is not associated to an Access Point and is not set up, pressing the WPS button will set up the extender to connect to an Access Point. If the extender is already set up and working in your network, pressing the WPS button will work to connect another client device to the extender. NOTE: This functionality is only available in the European versions of the RE3000W. Reset button – Press the Reset button for five (5) seconds to reset the range extender to its factory defaults. You can also reset the device from the Administration > Factory Defaults screen in the range extender’s web-based setup page. Ethernet port – the Fast Ethernet (10/100 Mbps) port works as a wireless bridge to instantly connect any wired Ethernet device to a wireless network. The green LED is lit when an Ethernet device is connected and active on this port. The light blinks when the extender is sending or receiving data over the Ethernet port. Can be set up using Linksys Connect setup software or through the web-based utility for manual configuration. The RE3000W only supports Wired Equivalent Privacy™ (WEP) with hexadecimal format security key. If your gateway is setup with a WEP ASC II format, contact your Internet Service Provider (ISP) for assistance. NOTE: For more details about this product, visit the Linksys Support Site to browse more troubleshooting articles, downloadable user guides or firmware updates and other support information.